Last edited by mpatou on October 10th, 2014, 3:52 pm, edited 1 time in total. There is another bug you can fix..
HHHaaa! Someone who really plays the game instead of just collecting it! Does this happen each time you do it? Which version did you play? What is exactly your equipment when it happens? I'll try to sort it out next week. If anyone finds anything else, don't hesitate to post a report here! Cheers.. yes I play it, its one of my faves. I can 1cc it, top score is 3.2million I think.. The version I play is an Engrish bootleg, it says for eg: "68 Gold" when I collect coins, the other Engrish bootleg would say "68 Gold Get". Yeah, the bug happens every time. You will know there is a bug whereby the armour is available in a mixed up order and the legend armour can be achieved on the third upgrade for minimal expense before it (a total spend of 160 gold then the Legend armour becomes available). I will buy the Legend boots in round 2, followed by Light armour (60 gold, pink colour) in round 3, then Heavy armour (100 gold, green colour), and I always have the Light shield (40 gold, pink colour) as I only buy the cheapest one (upgrades have no difference other than colour). ..and Wonderboy behaves as if all surfaces are ice, just like he does on the ice stages. The ice skates effect disappears when the green armour is changed/upgraded. An annoying glitch as this the way I play for highscore. It's not a game finisher though as the Legend 540 Gold armour is available in the second stage of the next level, just make a couple of boss fights trickier than they should be!. I caught it on video too, its in my 1cc video. You can see it happen, watch from 8mins.. it happens at 8.25 you can see the huge difference in the way Wonderboy handles! I though you were playing one of the romsets I worked on. I haven't tested anything yet, but I though about it and here are some leads I'm gonna explore : all the bootlegs romsets (when I say bootleg, it doesn't include VC version) are base on the Japanese Old version of the game. Maybe the sliding bug you encountered was corrected in the "new" japanese version (with ep11031a file for IC90 instead of epr11031 file), and so "maybe" this was corrected on the VC version of the game. Anyway, this bug is not due to the decryption process I spent time on, BUT if this bug has been corrected on the Japanese new romset, and not on "my" english romset (base on the VC game), It's possible to corrected it. On the contrary, if it's still on the Japanese "new" romset, I'm affraid I won't be able to do anything. The coin glitch that gives 63-68 golds when getting hidden treasures occurs on every version of the game. This was not intentional, but finally the game is as it, and now it's part of it. Sharky will tell you how much I love this game too!!! Noticed the gauntlet instead of the sword, gutted! Please show me the roms? Are they on Porchy's site? Holy ****. 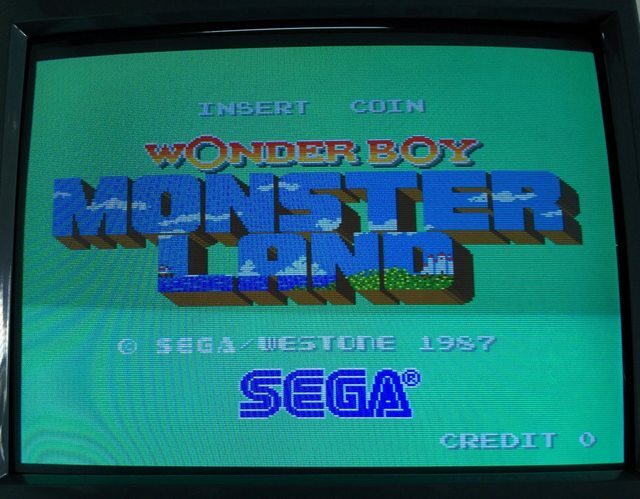 Wonderboy in Monsterland is my favourite game! I need to go back through and read this whole thread, but just had to say...holy ****! "Gold get" is the version i know and love! I'll look forward to playing this version one day too. @paulcan69 : Number indicated on Porchy's website (317-0043 for WBML) is the reference of the modified Z80 (with the battery and the decryption program) that was first on your PCB before been unsuicided. Now it's removed, that's the reason why you can't find it. @everyone : you can download the roms files at the last page of the download section here. There is a directory called 512k which contains files that you must use if your board has been modified to fit with 512k eprom (27c512) for IC90 and IC91. Those files work on bootleg PCB too. I also put 512kb IC92 file in case someone uses a bootleg PCB that requires 512kb ic92 file. For bootleg PCB, locations are called differently. In any case, you'll have to burn mpatou.ic4 mpatou.ic5 and mpatou.ic6 on 27c256. EDIT : I forgot to say, do not use these files for commercial purpose! Last edited by mpatou on August 7th, 2014, 8:01 am, edited 4 times in total. This is great news. Imagine a proper English version of this game becoming available after all those years, such a little known game as well.. astonishing that it happened! If someone predicted that ages ago they would have been laughed at- more chance of winning the lottery. Excellent, thanks a lot for this nice work! I have an original PCB with modified 512k EPROMs, what do i have to do to use the 256k ones again? Just remove the wires they put on the two 512k EPROMs, to get it running again with new programmed 256k ones? Also my PCB is lacking sound, any idea if this could be related with the modified 512k EPROMs? It's not necessary to undo the modification if you don't want to, just use 512kb rom files that are in "512kb" directory of the archive. Are the patched roms bugfree yet or are there still known issues? It has same bugs as the original japanese "new" romset, like money bug for exemple (that is considered part of the game now). I don't know how to fix it and I don't want to correct it. If someone find a non-reported bug, just let me know. Excellent, merci bien mon ami!